High Quality Content by WIKIPEDIA articles! 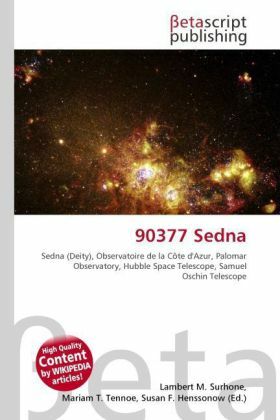 90377 Sedna is a trans-Neptunian object and a likely dwarf planet discovered by Michael Brown (Caltech), Chad Trujillo (Gemini Observatory) and David Rabinowitz (Yale University) on November 14, 2003. It is currently 88 AU from the Sun, about three times as distant as Neptune. For most of its orbit Sedna is farther from the Sun than any other known dwarf planet candidate. What came to be known as Sedna was discovered during a survey conducted with the Samuel Oschin telescope at Palomar Observatory near San Diego, California (USA) using Yale's 160 megapixel Palomar Quest camera annear San Diego, California (USA) using Yale's 160 megapixel Palomar Quest camera and was observed within days on telescopes from Chile, Spain, and the USA (Arizona, and Hawaii). NASA's orbiting Spitzer Space Telescope was later pointed toward the object, putting an upper-bound on its diameter at roughly three-quarters that of Pluto (less than 1,600 km). The object is named after Sedna, the Inuit goddess of the sea, who was believed to live in the cold depths of the Arctic Ocean. Before Sedna was officially named it had provisional designation 2003 VB12.